EZPhysics lets you interactively embed objects supported by the physics engine into 3D meshes, attach joints and constraints to the physics objects, save the “physically rigged” scenes into files, and run simulations or embed the physically rigged scene into your projects. EZPhysics looks great, kind of what I've been looking for. However, can you tell me pros/cons vs. Gazebo? Gazebo also uses ODE and OGRE. I haven't seen before this new incarnation of Gazebo but it looks quite good and development is sponsored by the one and only WillowGarage. The original Gazebo from the player-stage opensource distribution was a very comprehensive and "heavy" system (when I developed the original EZPhysics back in 2003, player-stage was the only game in town. Today there are few dozens of 3D physics simulators). 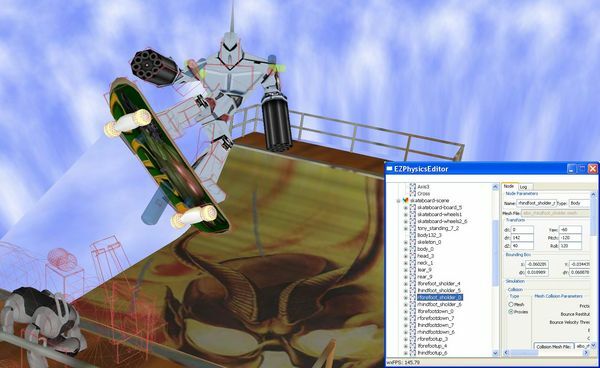 EZPhysics was initially intended as an extension of Ogre3D and coined the term "physical rigging" which implied adding physics and actuating skeletal animations. (Naturalmotion showed up around the same time and kind of did what i wanted to do - actuating a rigged model - but their intent was games and movies special effects, not robot control). EZPhysics is for developers and control engineers. You can create closed loop control framework as was done in the Actuatedcharacter.com project with Robotis servos. The coding convention is similar to that of Ogre3D (Singleton design pattern for example). It combines Ogre3D and ODE physics simulator, There is a GUI editor that exposes all of ODE's objects data, where you can upload custom inertial data, measured by other means. It supports network closed loop remote control optionally via Matlab/Simulink. Hi, Thanks for you work on this, and for releasing it open source. I've been looking for software like this for some time. Can you tell us a bit more about the software development plans? Do you see it continuing? What are the requirements for the exe file? I tried running in under WINE in Linux, but it doesn't work, so I wondered if I was missing some dependencies? Can it be built for Linux or Mac? Any instructions? I didn't see any in the source code? BTW http://actuatedcharacter.org/ doesn't seem to be working at present, but the blog is functioning. There are currently a couple of developers that are can resolve bugs in EZPhysics. I hope that many people find it useful. If someone wants to develop a real-time visual simulation linked with Simulink and/or Robotis servos, then this framework provides a great starting point. Thanks for the quick reply. I got the url from exe_cutable's original post in this thread. Do you see it continuing as an open-source, windows based project then? Do you have any make files etc used for compiling?